Gemix is one of the most colorful slots in the PlayNGo portfolio, challenging players to unlock several bonus features and win a top fixed payout of 1000 coins. Although an unconventional slot in all ways, Gemix is based on standard slots rules. Players need to place a bet and hit the spin button to set the reels spinning and create winning payouts. There is also an Autoplay feature for players who would like to spin the reels automatically. 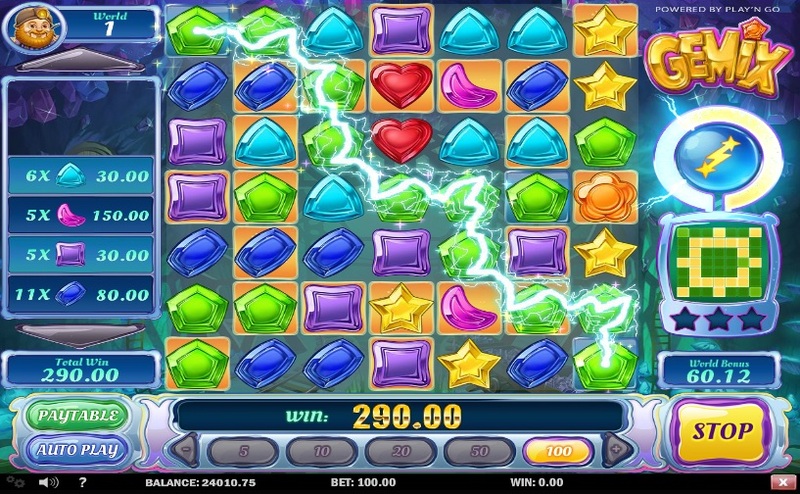 Gemix, an online video slot with seven reels and seven rows, resembles games such as Candy Crush Saga and Bejeweled. The reels feature glittering gems of different shapes, such as orange flowers, green pentagons, purple squares, pink crescents, red hearts, yellow stars, and turquoise triangles. The sound effects, graphics, and ambience music are awesome, driving players to this slot over and over again. Gemix features three types of worlds and challenges players to move from one world to the other by spinning at least three of the six combinations specified. The slot has wild symbols too, but there is a different wild symbol for each world. Depending on the world players are in, the wild symbol can be a lantern, a spell book, or a lollipop. Under special circumstances, these wilds can transform into spreading wilds or falling wilds to help players win larger payouts. Since Gemix is an unconventional slot, it is played and won in different ways. To win payouts, players need to create a group of at least five identical symbols. When this happens, the symbols in the group vanish and symbols from above fall in the space created, leading to more matches and wins. The game has a crystal charge meter that gets charged with each winning combination created. The meter gets fully charged if players collect 20 symbols. However, players can super charge the meter by collecting 40 symbols. The bonus features associated with the charged and super-charged meters are the same; however, players will get a multiplier value of x3 for super charging their meter. When the crystal charge meter gets charged up, bonus features such as the Nova Blast, the Light Beam, the Crystal Warp, and the Chain Lightning can get activated. During the Nova Blast, symbols explode at random, leaving replicas in their neighborhood. During the Crystal Warp, a symbol is selected at random and all other matching symbols are converted into symbols matching those in the neighborhood. During the Light Beam, a selected symbol emits rays of light in any direction and all the symbols touched by the light are converted into matching symbols. During the chain lightening, lightening flashes over the symbols and converts many symbols into matching symbols. Since Gemix is an innovative slot with exciting bonus features, players just cannot afford to miss it.